Love between women is honored in the lives of Biblical figures Ruth and Naomi. Some churches observe their feast day today (Dec. 20). In the Bible Ruth was born to a pagan family and married the Jewish man Boaz. In Judaism she is honored as a convert. Ruth is an ancestor of Jesus Christ, listed in his genealogy in the gospel of Matthew. It reports mostly a male lineage, and Ruth is one of only four women who are included. Naomi was the mother-in-law of Ruth and Orpah. 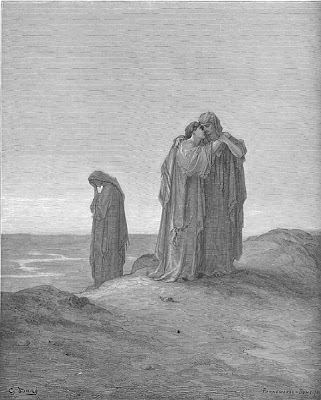 After their husbands died, Naomi urged both of them to remarry. But Ruth refused, declaring her love in words that have extra meaning for LGBT people because they were spoken between women. 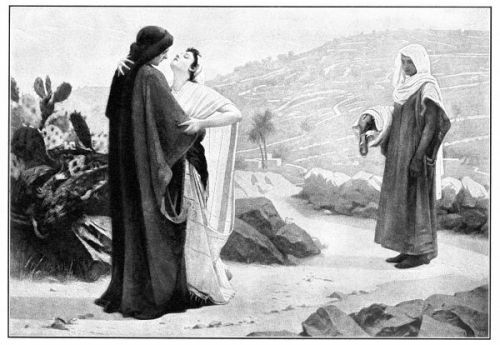 Were Ruth and Naomi lesbians? 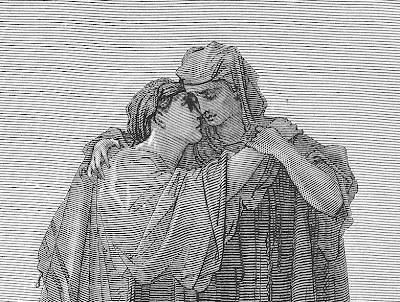 The same Hebrew word (dabaq) is used to describe Adam’s feelings for Eve and Ruth’s feelings for Naomi. In Genesis 2:24 it says, “Therefore shall a man leave his father and his mother, and shall cleave unto his wife: and they shall be one flesh.” The way that Adam “cleaved” to Eve is the way that Ruth “clung” to Naomi. Countless couples have validated this interpretation by using their vows as a model for how spouses should love each other. 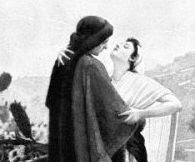 The openly lesbian interpretation dates back at least to 1937, when the novel “Pity for Women” by Helen Anderson was published. The two main characters, Ann and Judith, recite Ruth's famous vow to show their commitment as a lesbian couple. Law allows these holy vows, your home is here. 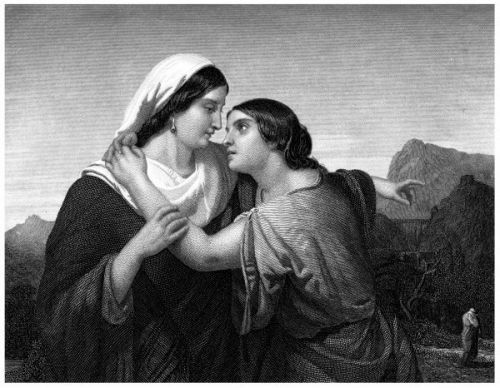 Enjoy a selection of Bible illustrations that celebrate the love between these two women of spirit. If you look closely, it sometimes seems that they are about to kiss. The previous two images are details from larger scenes that show Orpah leaving while Ruth stays with Naomi. 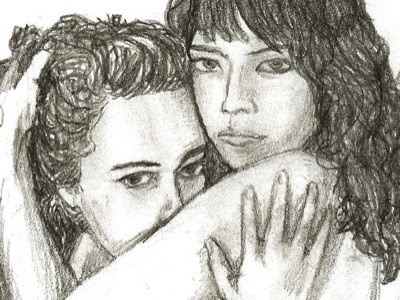 Artist Brandon Buehring included Ruth and Naomi in his “Legendary Love: A Queer History Project.” He uses pencil sketches and essays “to remind queer people and our allies of our sacred birthright as healers, educators, truth-tellers, spiritual leaders, warriors and artists.” The project features 20 sketches of queer historical and mythological figures from many cultures around the world. He has a M.Ed. 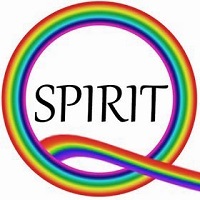 degree in counseling with an LGBT emphasis from North Carolina State University in Raleigh. He works in higher education administration as well as being a freelance illustrator based in Northampton, Massachusetts. Ruth and Naomi’s love has been illustrated by many artists, including the great English Romantic painter William Blake. 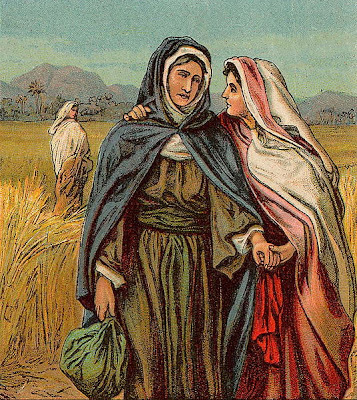 The hardships experienced by Ruth and Naomi are often overshadowed by their famous vow of love and their association with the giving of the Torah to the Jewish people. Ruth is revered as a Jewish convert and an ancestor of Jesus. 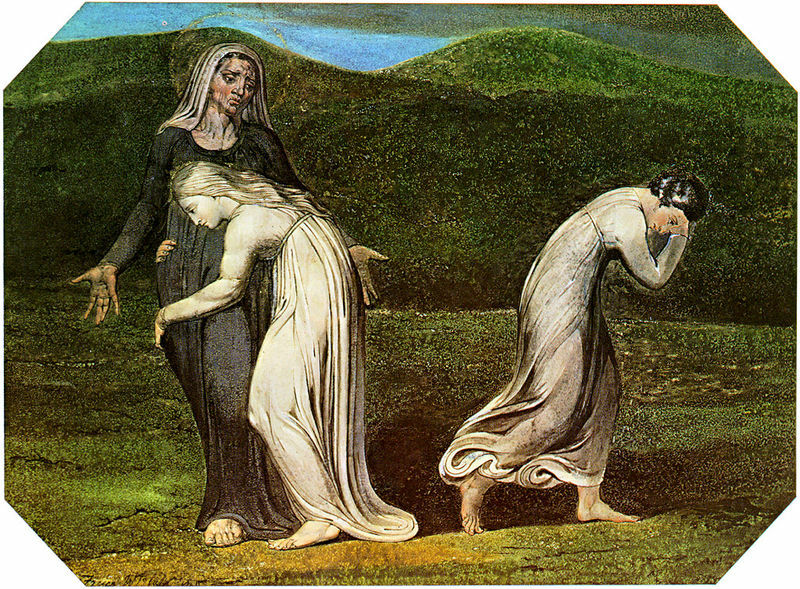 But Ruth and her Israelite mother-in-law were so poor that Ruth had to survive by picking up leftover grains of barley in the fields after harvest. 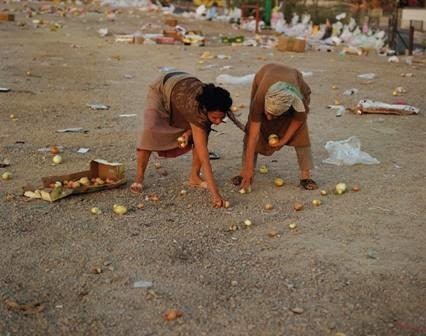 Gay Israeli artist Adi Nes brings home the reality of their poverty by showing the pair scavenging onions from a contemporary street littered with trash after an open-air market. They are posed like the peasants in Millet’s “The Gleaners,” a painting well known for showing the dignity of society’s poorest members. 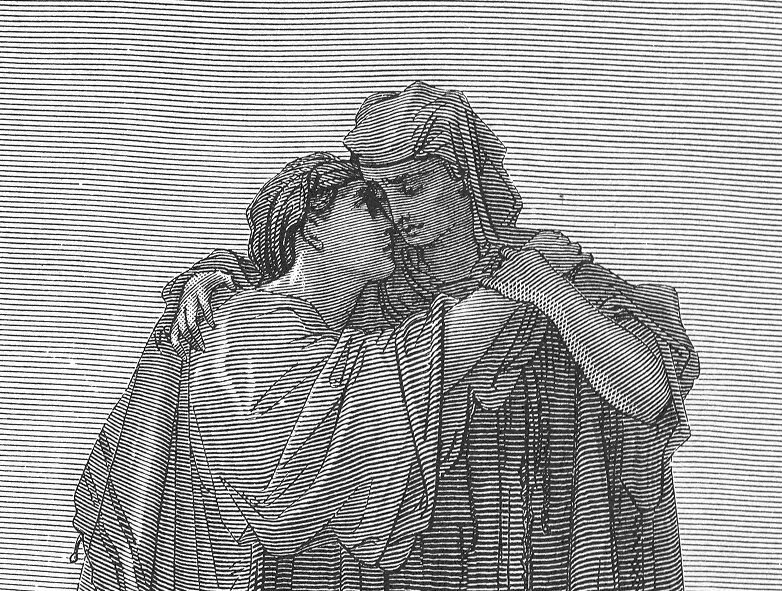 The careworn faces of Ruth and her beloved Naomi become visible in a second portrait by Nes. He shows that their love for each other is all they have as they sit together among discarded crates. For more about Adi Nes, see my previous post "Adi Nes: Gay Israeli artist humanizes Bible stories." The painting below, “Whither Thou Goest” by Trudie Barreras, was commissioned in 2004 by Rev. Paul Graetz, pastor of City of Light / First Metropolitan Community Church of Atlanta, for a sermon series that he was doing on the Book of Ruth. 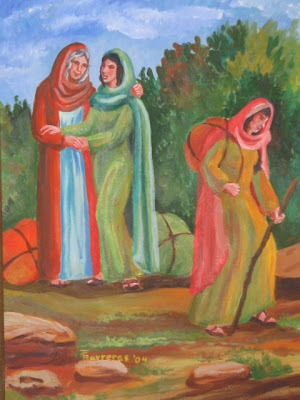 Acrylic, 18” x 14.” Collection of City of Light / First Metropolitan Community Church of Atlanta, GA.
A billboard featuring Ruth and Naomi is part of the Would Jesus Discriminate project sponsored by Metropolitan Community Churches. It states boldly, “Ruth loved Naomi as Adam loved Eve. Genesis 2:24. Ruth 1:14.” The website WouldJesusDiscriminte.org gives a detailed explanation. Special thanks to CJ Barker for the news tip.